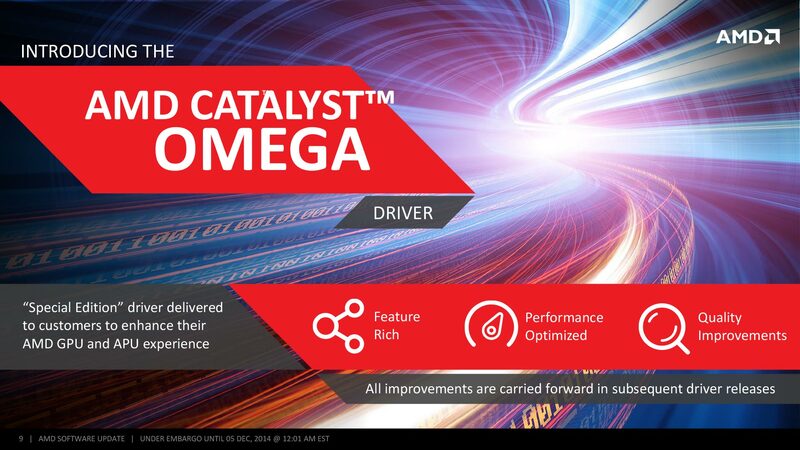 Over the past day or two you've probably seen the announcement of AMD's Catalyst "Omega" driver. 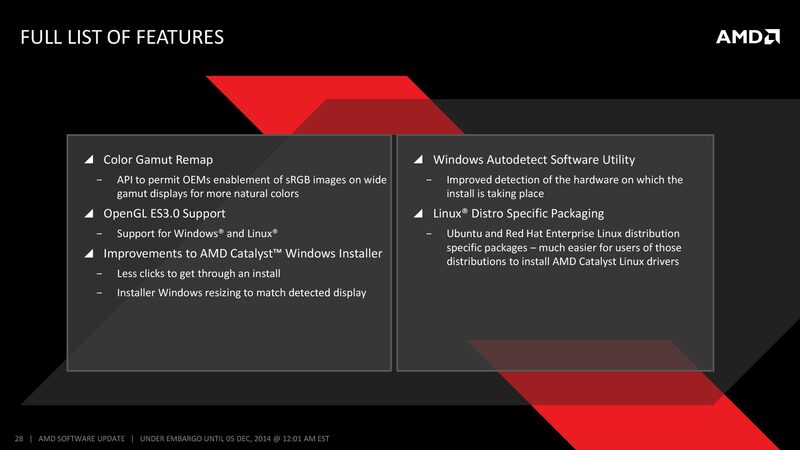 I've been digging through the details in the press deck, and I've reached out ot AMD with a few clarifying questions. This article outlines the features that I think will be of most interest to gamers. Usually I don't both with video enhancements and updates in new drivers. Generally they don't impact me that much, and its' not worth digging into the details. I usually chalk it up to a set of general updates to performance and quality. The Omega driver includes a couple of enhancements that I think I will actually notice, so I think it's worth pointing them out. The first is Contour Removal. This one is designed to clean up compression artifacts in movies, without impacting the detail. Pristine sources such as Blu-Ray rarely have to deal with the artifacts that appear in compressed/streamed media such as an iTunes movie. When watching an iTunes movie, either on a PC or AppleTV, The "splotchy" color artifacts seen in gradients such as shadows and sky are readily apparent in blue sky or dark shadows. Contour Removal works to remove these artifacts, giving the compressed video a higher quality appearance, more akin to the original source. The second set of features is used to enhance the overall quality and sharpness of video. 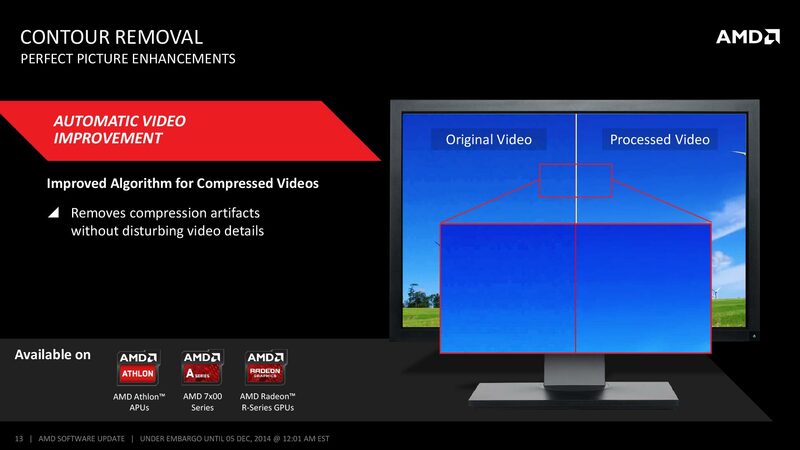 "1080p Detail Enhancement" works to improve the quality of sub-1080p video, when played back on APU-based systems. This type of enhancement is well suited for an APU-powered HTPC, when playing back older and/or lower quality video content. 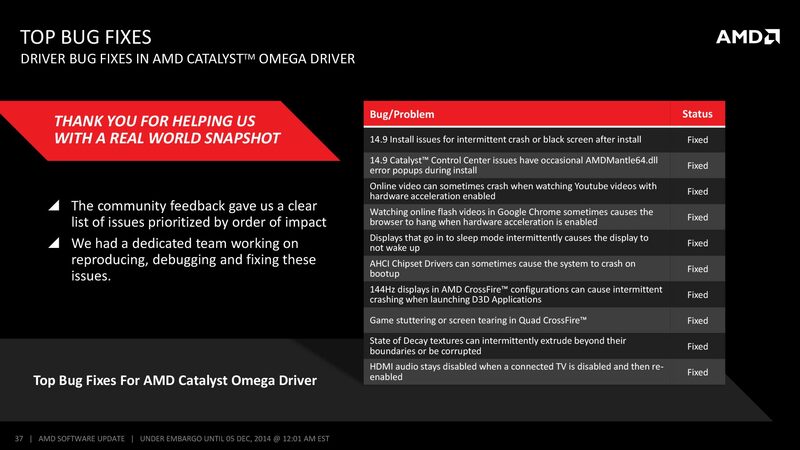 Similarly the Omega driver works to improve the quality of 1080p video when viewed on a 4k UHD display. This will be useful for anyone with a greater than 1080p display - be it 1440p, 1600p or 4k UHD. This type of detail enhancement will also come in handy when playing back 2:35 1080p video on an ultra-wide display (which is enlarged to fit the wider aspect ratio). Now, on to the gaming. 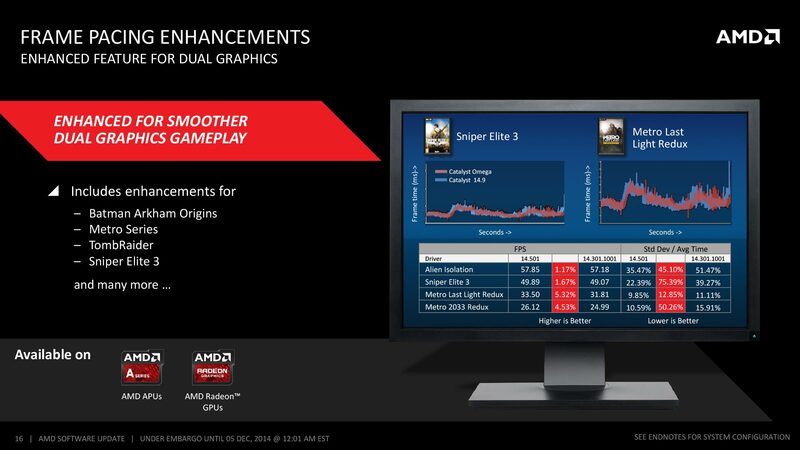 Frame Pacing has been a nagging issue for AMD users with dual-GPUs. While performance increased with a second GPUs, the variability from one frame to the next also increased. AMD has worked over the last year to implement and improve Frame Pacing in its various driver releases. The Omega driver continues this trend with improvements on a number of titles. 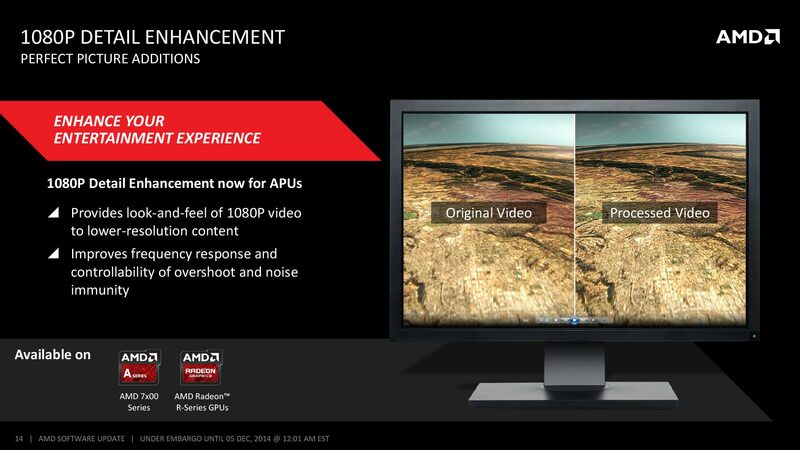 AMD is also releasing a new technology called Virtual Super Resolution. 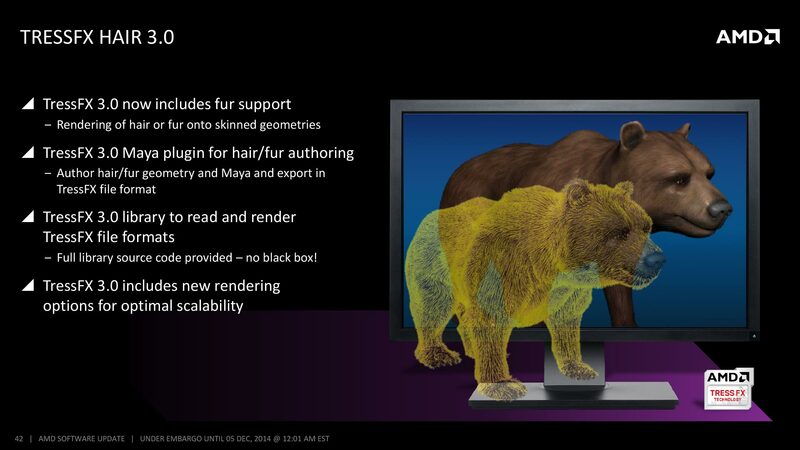 This is similar to NVIDIA's "Dynamic Super Resolution". 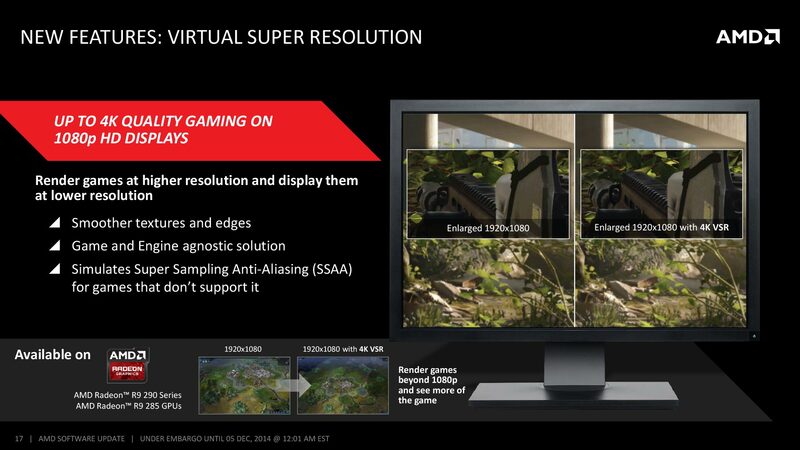 AMD's Virtual Super Resolution allows you to render games at a higher resolution, and then scale them down to your monitor's resolution for display. The benefit is higher resolution textures and more details in the image. It also simulates for SSAA (Super Sampling Anti-Aliasing) for games that don't support it. This features also brings an additional reason for the WSGF to test games in 4k. If the game doesn't properly support 4k UHD, then you won't be able to successfully use Virtual Super Sampling. If the HUD or other elements don't work in 4k, then the game would be unplayable in VSA. Currently, full 4k VSA is only available on the RP 285. The new board has additional hardware that is used for the 4k rendering without additional performance hit (over the 4k rendering itself). The R9 290 family allows scaling up to 3200x1800 - Quad 1600x900. 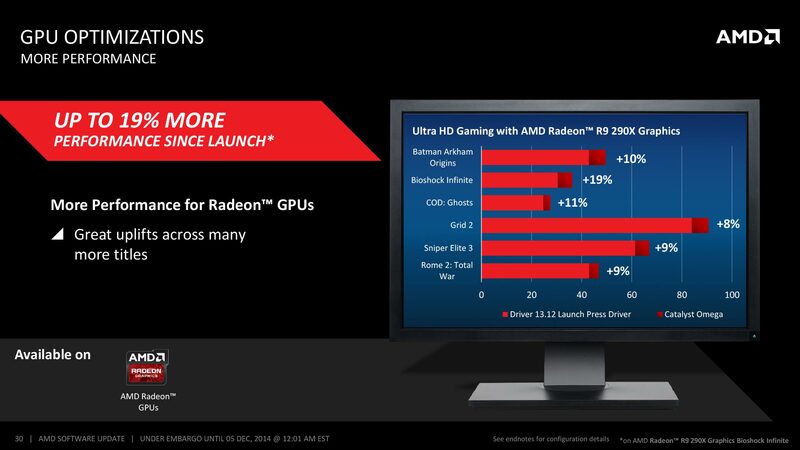 AMD is working to release a new driver in the Jan/Feb timeframe that will add full 4k scaling to all R9 and R7 products, 260 and higher. This will be a software solution, and will add a bit of extra overhead. Future hardware releases should have the necessary hardware for full 4k UHD scaling out of the box, without the extra performance hit. There are a number of other features in the release, many of which are outlined in these two slides. Some have already been touched on, such as the Frame Pacing improvements. The slides also lay out several improvements to setup and configuration: improved time for display enumeration, fewer clicks to install the driver, faster hardware autodetect, and distro-specific driver packages for Ubuntu and Red Hat Enterprise. There is one feature that stands out amongst pack - Rotated Eyefinity Support. This feature, which allows for "PLP" (Portrait Landscape Portrait) Eyefinity configurations, is limited to the new R9 285. The solution requires additional hardware on the card, to handle the display rotation, and still give a single Eyefinity SLS (Single Large Surface). Due to the hardware requirements, this feature is currently limited ot the R9 285, but will be supported in future hardware releases. I know that PLP has been a desired feature for quite some time. But, with the release of 21:9 panels, and the 3440x1440 panels in particular, I'm not sure how much demand there still is for PLP. Traditionally, PLP has been thought of as a smaller widescreen or 4:3 panel, rotated to match the height of a center landscape panel in widescreen. A configuration of 1200x1600 - 2560x1600 - 1200 results in a resolution of 4960x1600 and an aspect ratio of 3:1. This compares to 21:9 3440x1440, which is 2.39:1. Both of these configurations are significantly wider than 16:9 (1.78:1) or 16:10 (1.6:1), but I'm not sure that the PLP would be worth the extra hassle and cost - over a large 21:9 panel. I reached out to AMD to get some details about the support, and to see what use cases were supported, and received some interesting feedback. Give the newer options for "Fit" and "Fill", you could do PLP using three widescreen monitors set in an "H" pattern. I know many folks (myself included) who like using a widescreen in portrait for web browsing, coding, or working on documents and spreadsheets. PLP in this setup would allos you to use a center section of each L/R monitor, adding extra field of vision beyond the center widescreen. This could be really cool and allow for users to have 2xP and 1xL for regular "productivity" work, and then game in "greater than widescreen" - all without having to rotate monitors. Above is a mockup for how that might look. Like most drivers, the Omega release contains performance increases. Comparing to original launch, we're seeing an average of 10% - 20% increase in performance. While these numbers sound great, and any performance increase is welcome, we need to put them in context. On the first bar of the first graph, we see that Batman: Arkham Origins has seen a 10% increase in performance wiht the R9 290X at 4k UHD. Given that the game only averaged just above 40fps, we're only looking at 4-5fps increase. With Bioshock Infinite, that 19% increase is only about 6fps. 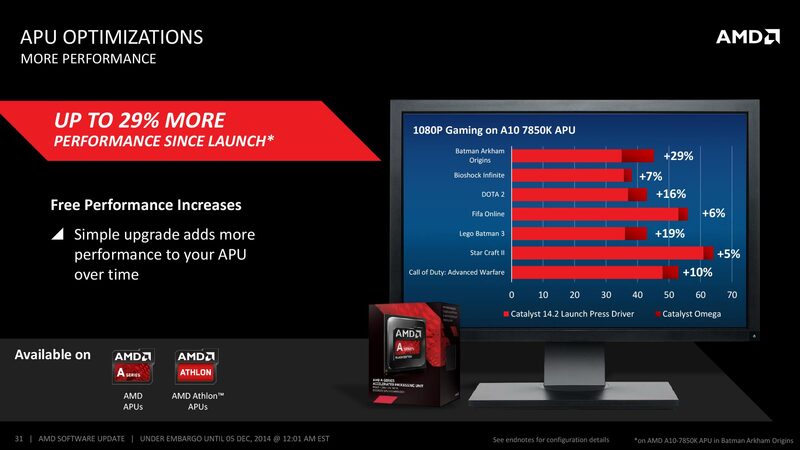 Many of the APU increases at 1080p are a higher percent, and start from a higher baseline. This results in a larger absolute fps increase, and pushes several titles past the 40fps mark. Again, the performance improvements are always welcome, but some are minimal in terms of absolute fps. 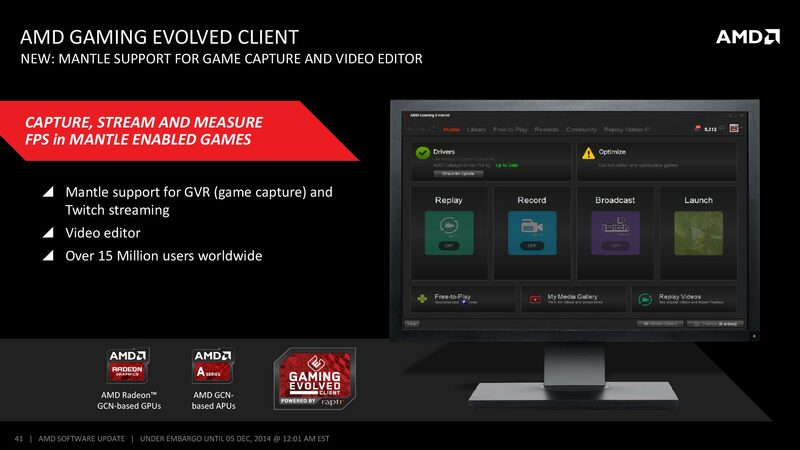 AMD's Gaming Evolved client from Raptr also saw an update, in that it can now capture, stream and benchmark with Mantle enabled. 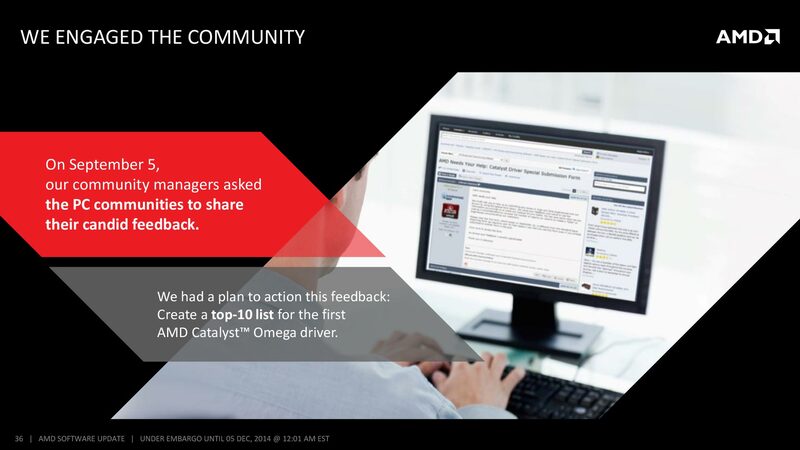 Mantle has been really well received by the development community, and has enabled significant performance improvement. But, it's been hard to measure or capture this, as program such as FRAPS leverage DirectX. I'm excited about this option, as I'm working to move away from FRAPS (it often crashes when taking 4k UHD screenshots), and these update gives me one more tool to try out. Finally, AMD has released the 3.0 update of TressFX. Beyond just seeing the lovely locks of Laura croft swing in the breeze, you could now see the hair of an animal company move realistically as its head was being scratched. The new release also comes with improvements and new features for developers. There were a few more bits released, such as support for FreeSync. This is AMD's open source solution for variable monitor refresh. There aren't any monitors out now, so it isn't a huge deal at this moment. Samsung is releasing several 4k UHD monitors in 2015 with Freesync support. These are the UE590 (23.6" and 28"), and the UE850 (23.6", 27", and 31.5"). These will be welcome features to 4k gamers, where frame rates certainly suffer. 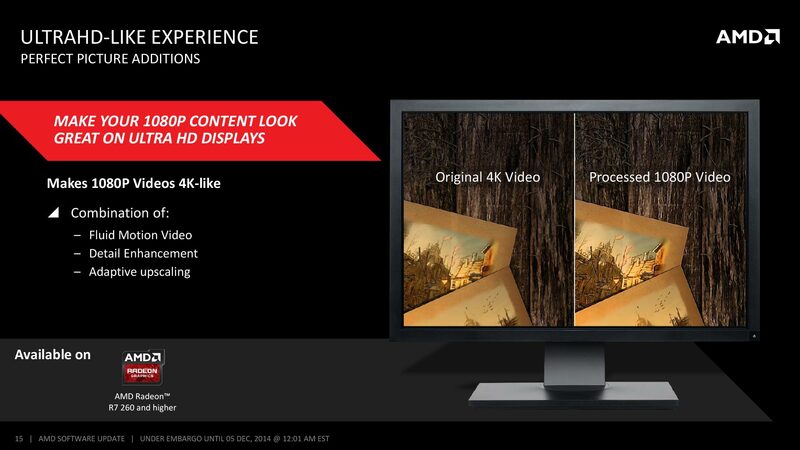 AMD also released support for Dell's 5k monitor, which runs at 5120x2800 (Quad 1440p). This panel won't be gaming focused, due to the insane pixel count of 14.7M pixels. The panel will require dual DisplayPort 1.2 inputs. Also, if you've seen the reports of "Eyefinity 24", where you can run 24 displays off of four GPUS, don't get too excited. The support is limited to FirePro cards, and is intended for video walls and digital signage. Besides, the horsepower to push that would be enormous. Lots of really good updates in this driver release, and a number of new feature releases, which will only improve with time. 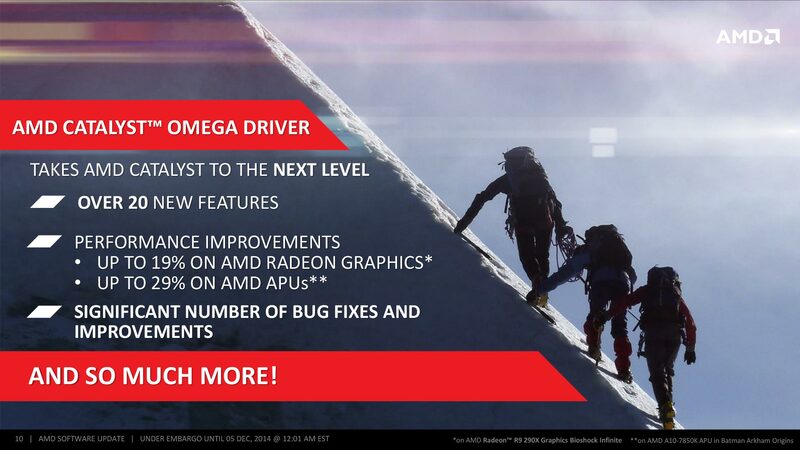 AMD has put together a huge update, and gamers should be excited about the new features, the performance improvements and a renewed interest to squash bugs and make installs easier.